Brewing a beer for a special occasion or life event is always fun. When my daughter was born last year I wanted to brew something different and something that would not only keep until she turns 21 but hopefully get better. I decided to brew an Old Ale but of course because I am me I needed to go “old school” and make sure it had a brettanomyces character in it. I lucked out too! Wyeast was going to release their Old Ale blend the following month. I didn’t get a chance to use that blend when it was released in 2009 but I had heard some very good things about it. I wanted to have a traditional base to this beer, but I also wanted something a bit bigger than the 1.090 style limit OG and something drier the 1.015 FG style limit (I detest sweetness in beers). 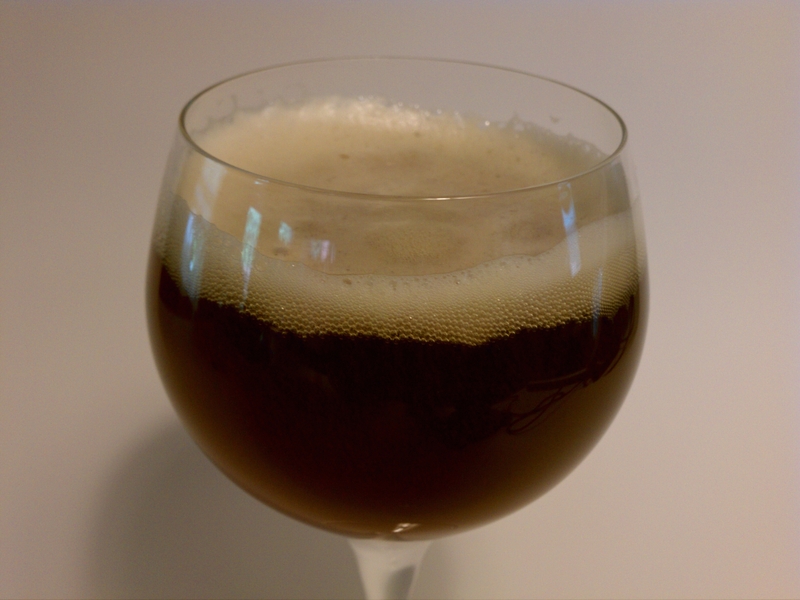 So the recipe I came up with ended up as a Specialty beer…more of a hybrid Old Ale. The beer sat in my 15 gallon Demi John for 4 months. 5 gallons was bottled and the other 5 gallons was transferred into a co2 purged 5 gallon carboy with 1oz of oak cubes. I’m glad I split the batch like I did. 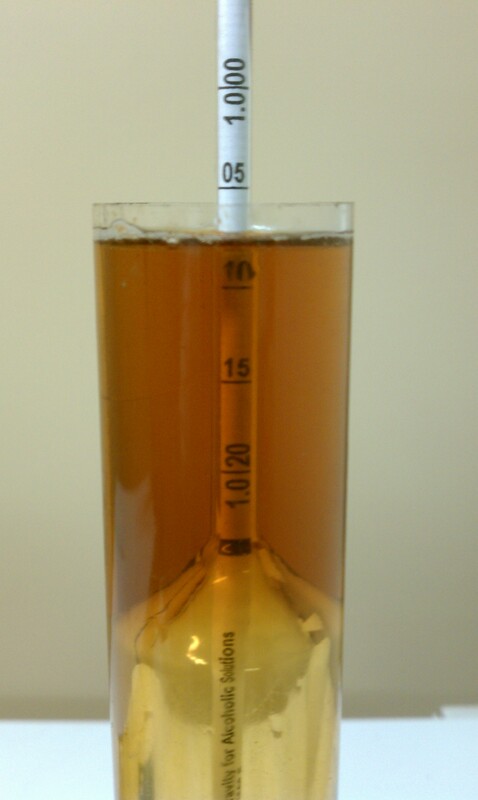 I took a gravity reading on the oaked version last night and it had fermented down to 1.007. At secondary transfer time it was at 1.010. The oak and the Brett Lambicus in the blend are really meshing quite nicely. I did start cold crashing the oaked version last night too. I will probably let it sit for a week. I’ll post some tasting notes in a few weeks after bottling. You can get a good idea of the color on the gravity reading photo. The un-oaked version is fantastic right now and I really think it will hold up over the long haul. It has been bottled for around 6 weeks now (I did remember to save 8 bottles for 2031, they are sealed up in a box). I did bottle them with only priming sugar and let the Brett do it’s thing, no other yeast bottling yeast was used. So far the few bottles I have opened have carbed up nicely. Gravity at bottling time was 1.010. Aroma – Toffee, Smokey, Peppery, Classic Brett leather with the aroma of earthy piney Nugget hops. Flavor- Again the classic Brett funk first, but even with it’s low final gravity a malty nutty dark fruit comes in right behind. To back that up it finishes with a leathery cinnamon flavor on the tail end. It has some alcohol but it is by no means a harsh alcohol flavor. Just a nice warming layer. Appearance– Copper/ruby in the glass. Tan head that stays intact for the entire drink. A medium amount of sticky lacking that hangs even when glass is empty. Something I would change for next time? I would probably go just a bit higher on the mash…. 152 or 153. It would still finish nice and dry, but I would like the Brett to have a bit more to chew on. In addition to the D-180 I would use some D-45 Amber syrup and back off the Demerara a pound. Those syrups are not just for Belgian beers! I accomplished what I wanted to with this batch: Something with a good solid base, changed up with some interesting simple adjuncts, Bretty, will hold up for many years, and most of all a project that will always re-mind me of a great time in my life I get to share with my sweet girl one day. How did you get the “Brett Funk” in just 6 weeks. Mine take 3 months or so to even start noticing it? Grinder- The beer is actually almost 6 months old at this point, it has only been *bottled* for the 6 weeks. So the Brett has worked for around 6 months now. How long did you leave it on the oak chips? I just racked my Old Ale onto some oak chips. I used 2 oz. of American (house toast) oak chips. I’m just trying to get some insight into how long it’ll have to sit in secondary. Thanks! I know you’re not blogging much anymore, but I figured its worth a shot. I’ve been contemplating an old ale as well, but noticed your recipe doesn’t have any amounts/details listed for the grainbill or hops. Was this intentional? Any chance you could provide the details? Cheers!